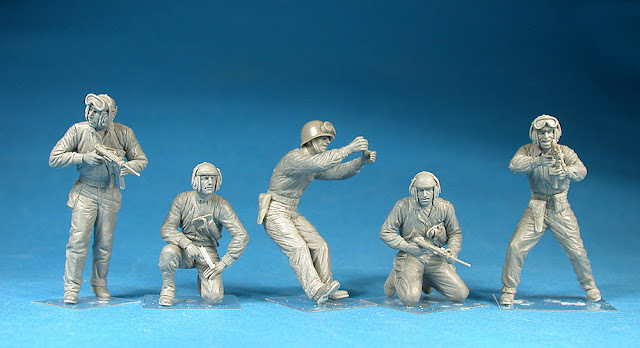 This box is usual fare for MiniArt collectors – a white box with the five figures captured this time in action packed poses – this tank crew are fighting OUTSIDE their vehicle. The figures look to me like a crew that have bailed out – as they have their tanker helmets on. Only one of this crew are really fighting from the tank – one of the figures is firing the .50cal machine gun with his M1 helmet and goggles on. 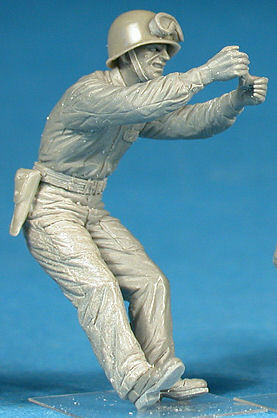 This set of a United States tank crew comes on two small sprues of light grey plastic. These sprues are divided neatly up into sections with each crew member to a section of the sprue to make the construction easier. While there are no sprue numbers there is a guide on the rear of the box part with a detailed part construction diagram and this includes a painting guide to help you apply colour to your tankers. MiniArt supplies a black and white sheet with the sprue numbers on it for your convenience. The colours are listed on the bottom rear of the box with Vallejo, testors, Tamiya, Humbrol, Revell, Mr. Color, and Life Color shades as well – so you would have to pretty much have some odd sources of paint for them not to have you covered! This is the most extensive colour call out I have seen in recent times, and I think all model makers should try to do this. Not everyone has the exact brand of paint the kit makers like or have some deal with. The plastic itself is pretty well moulded. You however have a lot of the seam flash that more than often come with injection moulded figure kits; it is pretty thin though so it is easy to remove. It is however on nearly every part. You will have to trim them all but this wouldn’t take too much work. There are no faults, short shots or other injection imperfections in these figures. In fact the subtlety in some of the overalls and clothing belies a resin kit – the quality of the sculpt is excellent for injection moulded figures. Just the flash LOOKS worse than it is. The most important parts of these figures for mine are the faces. Even though they have a seam either side of them the faces are all different to each other and look well sculpted. There is some real skill in the creation of each of these and the expressions and features like lips and brows all look different – with some skilful painting these can turn out great. We will go through each figure individually - starting with the figure “A” through “E” on the back box art. 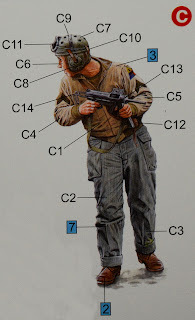 The soldier has the long tankers coveralls with a double pronged belt on as well as a colt pistol holder with the “U.S” clearly readable on it. 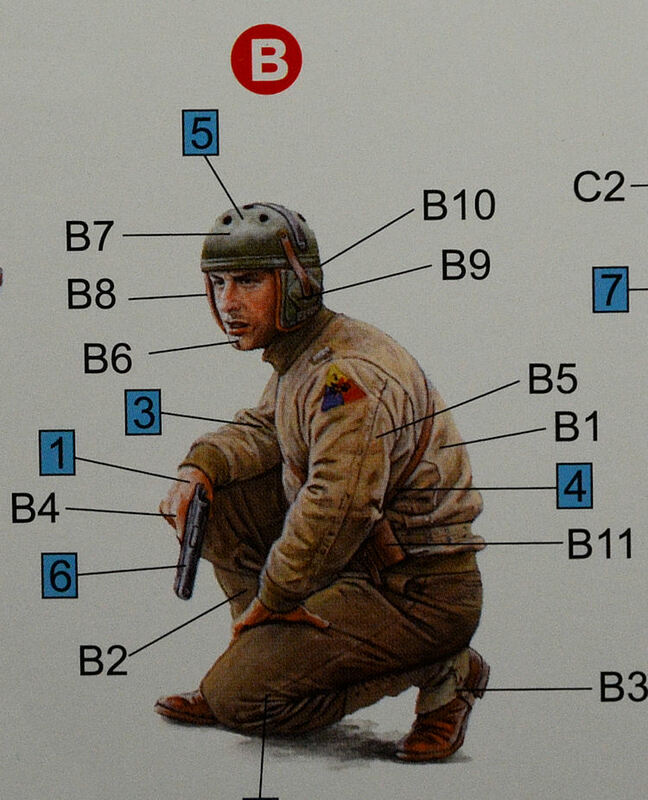 On his head the tanker wears a Tank Helmet M-1940 with “US Resistol “goggles - of which there are three pairs of in this kit - separate from helmets so they can be included or left out as to your discretion. 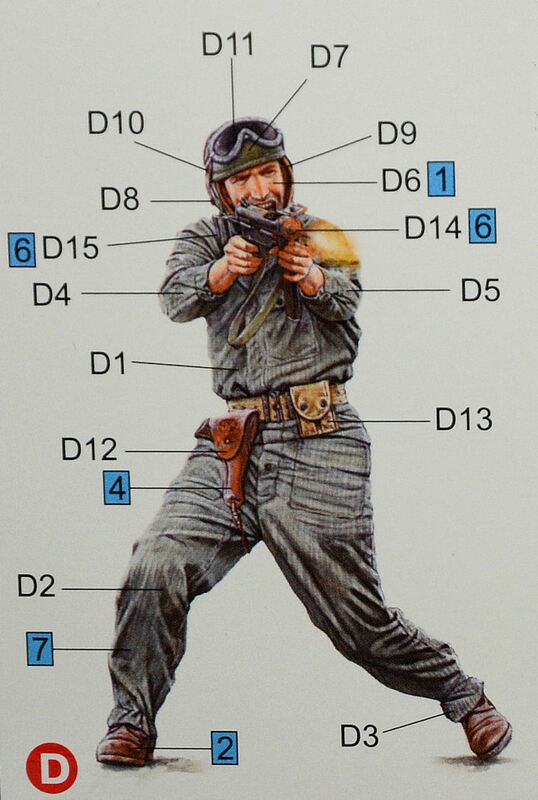 He carries no gun and his hands are moulded in a way that he is firing a double vertically triggered gun – so it pretty much fits in with a Fifty Cal which would sit on top of most allied vehicles. Tanker B is seen squatting on one knee looking on anxiously while his comrades fight it out with the enemy. The figure wears spats over his shoes and some thick woollen pants, plus a Winter Combat Jacket complete with an elasticated collar. This tanker comes with a three part M1938 tanker's helmet. 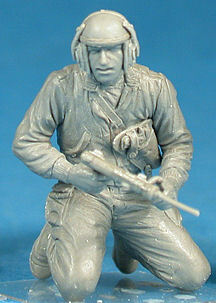 A pistol is moulded in this tanker’s hand so this could mean he is the officer – although he has no patches or other distinguishing marks on him it is impossible to tell in this kit really – maybe figure A as he has the helmet for being outside the vehicle on instead of a padded number – I am not sure. The 5th armoured badge shows on his sleeve on the artwork but the patch isn’t on the plastic. Actually the pistol isn’t this kit’s finest hour – and will need to be trimmed of a bit of flash, which this kit has a fair share of. This extra plastic (free) isn’t a big deal though – and after a little clean up this kit comes up o.k. The holster for the pistol however is smartly moulded with no pistol in it!! Tanker C is peering around his shoulder looking backwards towards his right hand side. The tanker is wearing the US tanker’s coverall, boots and a helmet with goggles. He hasn’t a pistol on in the box-art but there is one included on his part of the sprue. You could add these pistols to any of these troopers I suppose – This soldier carries a close combat “grease gun” stamped metal light machine pistol. These were favoured by US tankers in the war for their small size and extendible stock. Our versions are pretty good here – but there is again some flash to be cleaned up especially very delicately around these stocks. 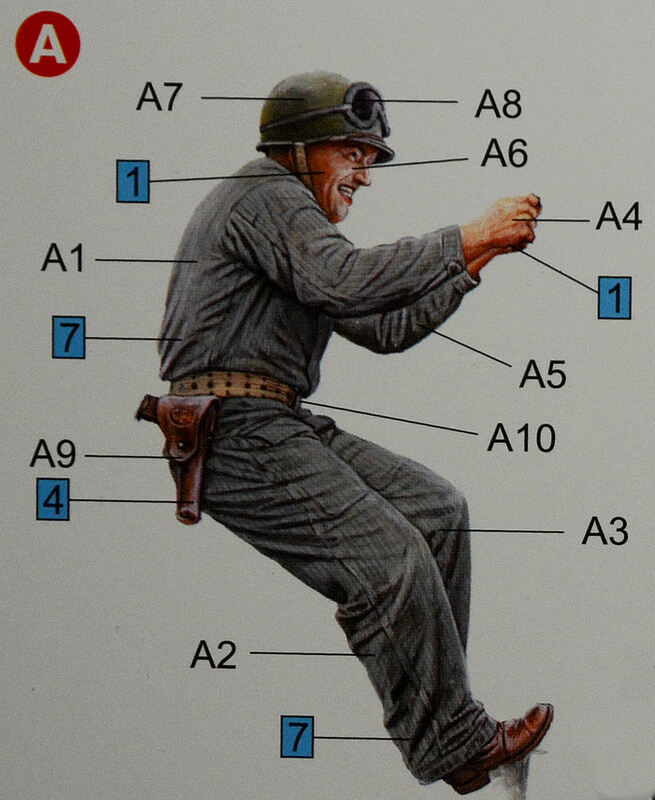 This soldier has a place for a corporal’s stripes on the sleeve of his winter jacket he is wearing as well as the patch for the 5th armoured on his shoulder - that is great – but we don't have either a decal or transfer for these emblems, it would have been a great addition and a shame it isn’t with the kit. The soldier wears some nicely weighted US tanker coveralls with a webbing belt, boots with a M38 tanker’s helmet - and the goggles on the front of course. An interesting thing about these helmets a that they were actually issued with the tank rather than to each soldier, and they were made by four companies; Rawlings Manufacturing Corporation, Sears Saddlery Company, Wilson Athletic Goods Manufacturing Company, and A.G. Spaulding & Brothers. Though essentially built to the same specifications, there were slight variations across the four manufacturers in terms of small details. 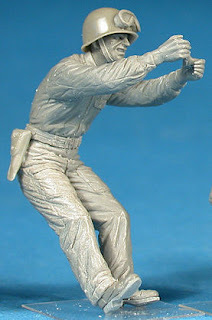 This figure’s legs are in an interesting position on the box art – slightly skewed to one side and twisting to get his body behind the centre of gravity. His legs are not as twisted on this kit as they are on the boxart however - and his pose is straighter on. 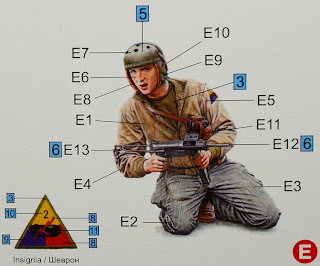 Tanker E is kneeling down leaning towards his right hand side slightly lower as if to be peeking around or talking to others on that side – he carries a grease gun and pistol in holster at the ready. His coveralls are added to with the tanker’s winter short jacket again with a 5th armour patch placement on the shoulder. He is wearing some simple boots with no leggings and a tanker’s helmet and goggles. 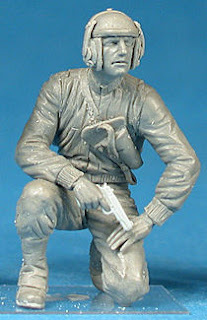 This tanker has a strap around his chest to which the .38 pistol and holster are attached like some of the other figures here. This set of tankers is quite dynamic in their poses and should suit a diorama maker after an action packed scene - maybe a wounded soldier wouldn’t go astray? A nice little set – which could do with some decals for the patches on the arms but apart from that this is a great set which you could split up or use all at once. Original in concept with the tankers fighting back outside the vehicle I like them. Just make sure you clean those seams!! Thanks to MiniArt for sending this set to review. 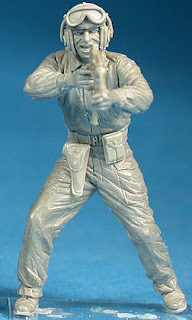 These a pic below from the MiniArt site of these figures constructed.